I've put myself on a yarn-diet for the new year - trying to use up some of my stashed yarn before I buy any more. 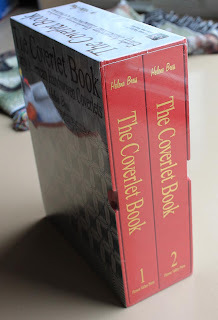 Since I'm not drooling shopping at yarn sites I've had more time to check out books and patterns . . . which has lead to lots a few of them following me home. 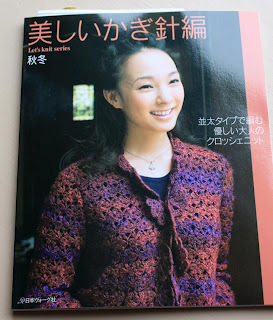 This is the first Japanese crochet book I've ever purchased. The patterns are all charted - fortunately for me - and most are gorgeous. There are at least 6 things in here I want to make immediately. And this - is my 13-pound treasure. Almost dropped the package when it was delivered yesterday, it was so surprisingly heavy. 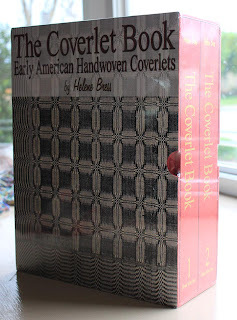 A two-volume treasury of handwoven, overshot coverlets that was half off its usual $160 price. How could I resist? Can not wait to dive into this one.